The Crook County Cowboys played well at times, but it wasn't enough as The Dalles Riverhawks used runs at the end of each half to come away with a 61-54 victory in the Intermountain Conference opener for both teams. "I think the energy was there, much better than Tuesday," Crook County head coach Darin Kessi said. "I can't fault our effort. We just had some lapses. I think that the way we prepared this week – and pregame was solid – I think that we were certainly surprised that we didn't get the win." The Dalles jumped out to a 7-0 lead early in the contest, but the Cowboys came roaring back, finally taking the lead at 12-11 on a pair of Shane Kessi free throws. The Dalles regained the lead and held a 17-15 lead at the end of the first period. The Riverhawks led 21-18 before the Cowboys went on another surge. Crook County scored 12 consecutive points and led 30-21 with just over a minute left in the first half. 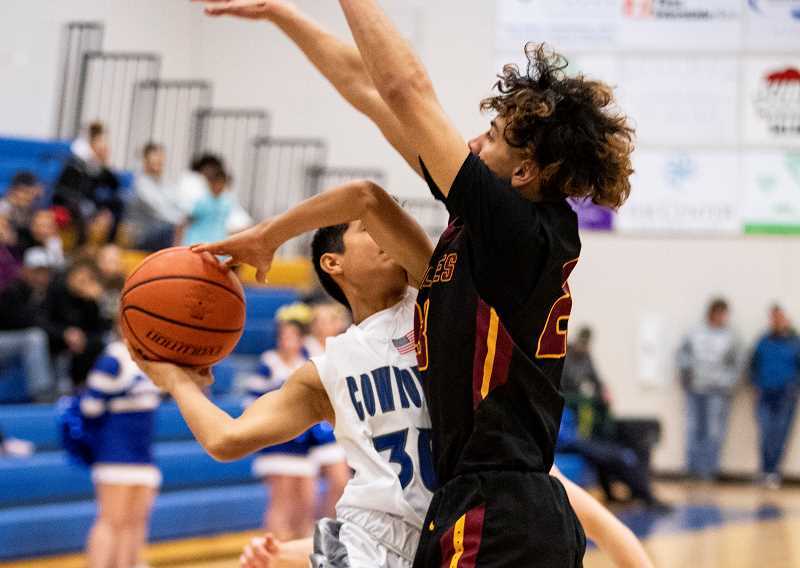 However, the Cowboys were unable to close out the half, committing several turnovers in the final minute as The Dalles scored the final eight points of the half to close to within a point, 30-29 at the half. "I think we had four turnovers right there and then defensively one of the things we talked about is if four guys do their job and one guy doesn't over the course of the game the ball finds the right guy most of the time." The Dalles took the lead again in the third period, outscoring the Cowboys nine to three before Crook County regained their composure. Once again the Cowboys rebounded, outscoring the Riverhawks 15-3 as they regained the lead. A Kevin Sanchez three pointer gave Crook County a 45-41 lead late in the third quarter. The Cowboys still led 45-43 at the end of the frame. Crook County held one last lead at 46-45. However, that was the last lead the Cowboys would have. Crook County struggled to score points the remainder of the game with The Dalles gradually pulling away to a 58-51 lead. Late in the game Crook County fouled in an attempt to lengthen the contest, and the strategy worked as The Dalles missed several free throws down the stretch. Unfortunately, Crook County was unable to take advantage as they were unable to get closer than six points the remainder of the game. Kevin Sanchez had a career high, scoring 23 points for the Cowboys mostly on long range bombs, hitting six three-pointers. "This first game was so important because these games, you can't get back," Sanchez said. "They are so valuable. I think as a team we've been a little flat, but I found a way to get the ball in the hole. In the second quarter there was a run where we blew a nine-point lead. I think that hurt us the most." Thaiden Mullan was also in double figures for the Cowboys with 11. 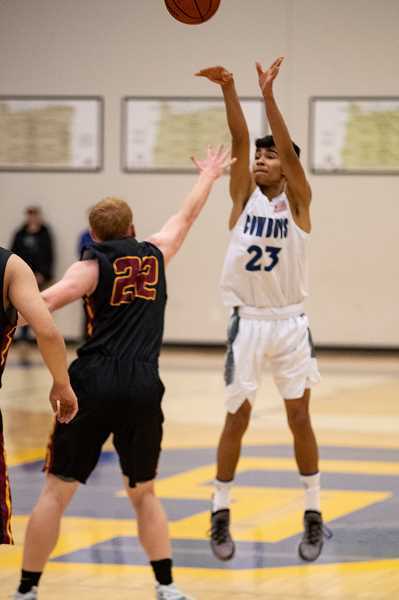 Jake Hernandez scored 21 to lead the Riverhawks, while Josh Nisbett and Dalles Seufalemua were also in double figures with 17 and 10 points respectively. With the loss the Cowboys fell to 8-7 overall and 0-1 in Intermountain Conference play, while The Dalles improved to 1-0 in league and 5-7 overall. "We just made it a little harder on ourselves tonight," Kessi said. "We have to keep working and we have to figure out how to steal one from Pendleton and do the same thing that The Dalles did to us tonight. I think it's possible. We just have to keep working. We have to continue to battle and continue to believe in each other and I still like our chances." Crook County – Kevin Sanchez 23, Mullan 11, Kessi 7, Savage 4, Langley 3, Graydon 2, Bishop 2, Lowenbach 2, J. Sanchez, Humeston, Chaney. Totals: 19 6-11 54. The Dalles – Jake Hernandez 21, Misbet 17, Seufalemua 10, Fernandez 6, Telles 5, Twidwell. Totals: 23 9-21 61. Three-point goals – The Dalles: Misbet 2, Hernandez 2, Seufalemua, Fernandez. Crook County: K. Sanchez 6, Mullan 3, Kessi.